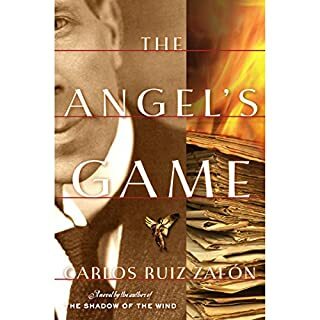 Internationally acclaimed New York Times best-selling author Carlos Ruiz Zafon takes us into a dark, gothic Barcelona and creates a rich, labyrinthine tale of love, literature, passion, and revenge in which the heroes of The Shadow of the Wind and The Angel's Game must contend with a nemesis that threatens to destroy them. Barcelona, 1957. It is Christmas, and Daniel Sempere and his wife, Bea, have much to celebrate. They have a beautiful new baby son named Julian, and their close friend Fermin Romero de Torres is about to be wed.
Kenny reads quite fast! I slowed the play-back down to 0.8 and it was better. Not my favorite reader in this book series, also, but my favorite story in the series. I appreciated getting Fermin's back story, but otherwise, eh... it was ok. 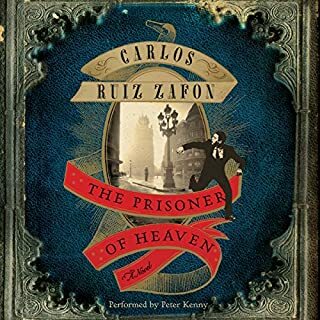 In an abandoned mansion at the heart of Barcelona, a young man, David Martin, makes his living by writing sensationalist novels under a pseudonym. The survivor of a troubled childhood, he has taken refuge in the world of books and spends his nights spinning baroque tales about the city's underworld. But perhaps his dark imaginings are not as strange as they seem, for in a locked room deep within the house lie photographs and letters hinting at the mysterious death of the previous owner. It's almost a nod to Dickens' style of writing with complex characters woen together in an intricate and surprising way. Though you could read them in any order, I'm finding g that reading them in the sequence they were published is quite fun - the subtle plot twists are great! 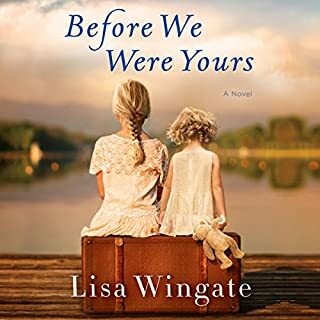 Barcelona, 1945: Just after the war, a great world city lies in shadow, nursing its wounds, and a boy named Daniel awakes on his 11th birthday to find that he can no longer remember his mother's face. 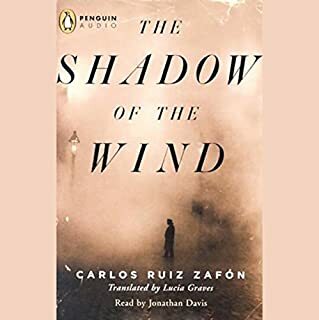 To console his only child, Daniel's widowed father, an antiquarian book dealer, initiates him into the secret of the Cemetery of Forgotten Books, a library tended by Barcelona's guild of rare-book dealers as a repository for books forgotten by the world, waiting for someone who will care about them again. The story read like a modern day Dickens novel - full of characters that were rich, deep, and intricately woven together. The reader was fantastic, showing a wide range of vocal skills. The reason I gave it three stars is because of STUPID and SERIOUSLY DISTRACTING PIANO FROM HELL! I found myself rewinding 30 seconds to relisted to a piece of the story I missed because that d×÷n piano. I mean, it's an audiobook, not a piano recital and not a day-time soap opera. it really killed the story for me - I thought about returning it, but the story was just good enough that I kept it and just endured the annoyance. This isn't just a great Stephen King book, it's also a fantastic performance by Gardner! I book-binged on this story. This updated version includes a lot more back story for minor and sub-minor characters. I really enjoyed that, but I could imagine some consumers of audio books may feel like it's taking away from the story. What was really amusing was to see how King's post-apocalyptic world could have been written yesterday rather than 30+ years ago. 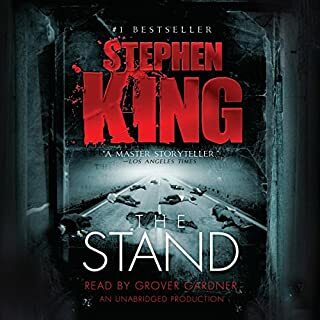 The story feels fresh and modern - and though I liked the made-for-tv movie version of Th Stand, I'm glad I finally got around to the book because it is much richer than the movie. This is how wars are fought now by children, hopped up on drugs, and wielding AK-47s. In the more than 50 violent conflicts going on worldwide, it is estimated that there are some 300,000 child soldiers. Ishmael Beah used to be one of them. How does one become a killer? How does one stop? Child soldiers have been profiled by journalists, and novelists have struggled to imagine their lives. But it is rare to find a first-person account from someone who endured this hell and survived. 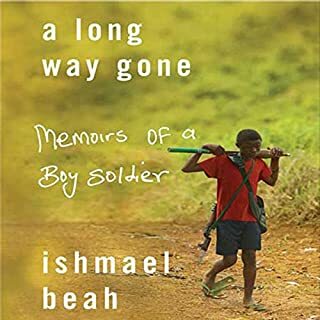 In A Long Way Gone, Beah, now 26 years old, tells a riveting story in his own words: how, at the age of 12, he fled attacking rebels and wandered a land rendered unrecognizable by violence. Listening to this book was a real Struggle Bus experience. I love this story. My teenage students who have reading disabilities and hate books LOVE this story. Listening to Beah read his story killed it. And I don't mean in a good way! His voice is better heard reading the look than listening to it. For those who want know exactly why - it's because he is so monotonous. There isn't a lot of variety in his voice. He does not change his voice pattern for the different characters, etc. So, while this is a good read and I recommend getting your hands on a physical copy from the store or the local library, I would not recommend the audiobook. The narrator's speech cadence ruins the story by dragging out wooorrrrdddssss. She also puts a lot of affectation in her speech, which I hate. The speakers voice is and extreme example of vocal fry. 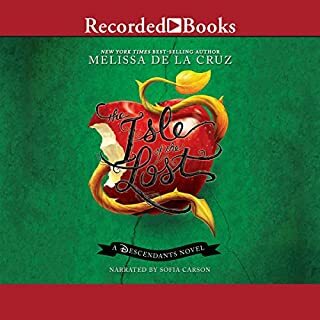 My 10 year old daughter, who LOVES audiobooks asked me to turn it off because the narrator's voice was so irritating to her that it was impossible to focus on the story. This story is boring. The reader's southern drawl is difficult to follow. Th combination just makes this an undesirable book.